Genomics, Medicine, and Pseudoscience: Does a standing desk lengthen your lifespan? Standing desks are all the rage lately. These desks allow you to stand up while working on your computer. Some standing desks can be raised and lowered, so you can alternate during the course of the day between sitting and standing. The principal argument for these desks is that they provide health benefits. Proponents of standing desks claim, plausibly, that they give you more energy and improve posture. The CDC has found that standing desks (or “sit-stand” desks) reduce upper back and neck pain and improve moods. 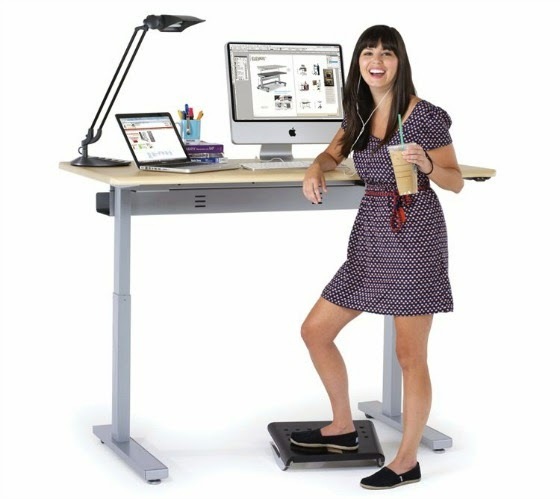 At Smithsonian.com, Joseph Stromberg reported that standing desks reduce the risk of obesity and type 2 diabetes. And a 2012 Australian study found that prolonged sitting increased the risk of death. In other words, standing up more and sitting less can help you live longer. All this makes me want to stand up right now. The newest claim is that standing up lengthens your telomeres. If true, this would provide a mechanism to explain how standing up might lengthen your life. The new study, led by Swedish scientist Per Sjögren, appeared this month in the British Journal of Sports Medicine. Telomeres are special DNA “caps” on the ends of everyone’s chromosomes. As we age, these caps gradually get shorter, and if they get too short, the cell dies. They function as a kind of molecular clock, telling a cell when it’s old. A substantial body of scientific evidence shows that if you can maintain telomere length, cells—and their owners—will live longer. But how could merely standing more, or sitting less, shorten our telomeres? Being skeptical, I read the paper. Here’s what Sjögren and colleagues did: several years ago, they conducted a study measuring the effect of exercise on weight, cholesterol levels, and a few other characteristics. That study included 101 people, all 68 years old. They randomly chose 49 people (14 men, 35 women) to study the effect of exercise on telomere length. They used blood samples taken 6 months apart, both before and after the exercise regimen. This was all completed back in 2011. Previously, they reported that there was no difference in telomere length between the “exercise” group and the control group. So how can they publish a new study that seems to reach the opposite conclusion? It turns out there isn't a new study at all, but a re-analysis of the original data. In the early study, the exercise program did have some significant effects: it increased the amount that people walked around by 1663 steps per day, and decreased their sitting time by 2 hours per day. However, people in both groups spent less time sitting over the course of the study. So the scientists re-analyzed the data and looked at telomere length as a function of four more measurements. For one of these measures, change in sitting time per day, telomere length was reduced enough that the relationship showed a p-value of 0.02. We've seen this sort of thing before: a small study with a minimally significant effect. Usually these types of results never get replicated. As much as I’d love to believe I could lengthen my telomeres by standing up a bit more each day, this rather implausible findnig is simply unconvincing. It’s based on a sub-group of only 12 people—and furthermore, this is a re-analysis of previous data, which feels an awful lot like cherry-picking. If there is any effect, it’s very small. Nevertheless, other studies do show health benefits from spending more time walking and less time sitting. A daily walk probably confers the same benefit as a standing desk, but a standing desk isn’t a terrible idea either. Just don’t count on it to lengthen your telomeres. Well done! This a very interesting blog, I will look at it very carefully in the future. Regarding the dodgy Swedish paper I can say the world is plenty of it, even on peer review journal. Anyway I have to pick up a small point. You say " A daily walk probably confers the same benefit as a standing desk". However, van der Ploeg et al, 2012 , as you already cited, state that :"Prolonged sitting is a risk factor for all-cause mortality, independent of physical activity", and " the strong relationship of increased sitting time to mortality persisted, even among participants with relatively high levels of physical activity". They seem to show this is true at least for person with cardiovascular disease or cancer (no matter if you go for walk/jog an hour a day if you are sat 8 hours a day your risk to day earlier). More difficult to say if it is also true for healthy people. But could also be that I didn't understand the paper (likely). Having gone from a job where I used to walk and stand a lot to one where I sit a lot, I realise sitting all day is not good for me. Nice to see a reasoned approach to this question.